The Twins FX present to you their latest entertainment addition, Dorothy, the walking, roaring T-Rex for hire. For over 20 years The Twins FX have been creating special visual effects, illusions and animatronics for the entertainment industry, their latest creation is a life size dinosaur that roams shopping centres, weddings, parties and corporate events. 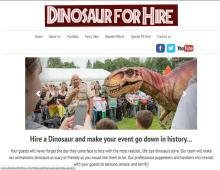 Dinosaur party hire is available in Dorset, Hampshire, Wiltshire, Somerset and beyond! Dorothy, the walking dinosaur, is part of The Twins FX dino hire package, this full size prehistoric creature will terrify and amaze your audience. You can hire a dinosaur, T-Rex skeleton, Megalodon shark or Sarcosuchus crocodile to bring your event to life. Browse the selection of dinosaurs for hire and view the videos on youtube to see the team in action. Dorothy the T-Rex for hire – Dorothy is the most popular dinosaur event hire animatic. The life size dinosaur, this T-Rex will have your crowd amazed with her sharp teeth and prehistoric complexion. Baby T-Rex – At just over 8 feet tall this baby T-Rex for hire can be as terrifying as your audience desires! But he can also be friendly for photos with younger guests. Looking to hire dinosaurs in schools throughout Dorset? The T-Rex baby dinosaur hire package is a ROARSOME choice! The baby dino loves being the centre of attention at any event. Rexy - the T-Rex skeleton from Night at the Museum. This T-Rex skeleton has a fully animatronic face capable of lip synch and he loves to chase after sticks! Bruce the Megalodon Shark - a massive beast that will make you fearful of the deep blue sea as you see him devour his latest victim. Bill the Sarcosuchus Croc – has a unique gait capable of moving like a real crocodile, this predator is 4 metres long and 3 metres wide, he will wow your audience with his snapping jaws. Hire an animatronic dinosaur, for a unique dinosaur party entertainment experience or corporate event. To find out more about dinosaur hire, hiring a dinosaur party entertainer in Dorset and how to rent a dinosaur from the portfolio contact The Twins FX.